For career minded individuals – Do you see the power of LinkedIn but can’t find the time to “figure it out?” I can meet for one-on-one sessions providing customized instruction on how to get started or how to maximize your use of LinkedIn. For career p rofessionals – Do you provide career services to others? Do you need to know more about LinkedIn in order to answer your client’s questions and successfully help them? I can explain everything you need to know to help your clients make the most of LinkedIn. LinkedIn workshops – Workshops are held in small groups. If a group of 5 or more people can be brought together, we can create a customized workshop. You might be interested in our recent series of LinkedIn webinars? Click here for more information on those. For groups – Does your organization see the value of training your staff on LinkedIn to increase sales and other growth opportunities? I can train any small or large group on Getting Started with LinkedIn or Maximizing LinkedIn, for people who already use LinkedIn but aren’t fully utilizing it. 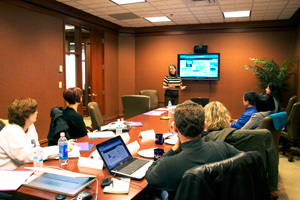 Packages can be customized for longer training or a series of workshops to address your organization’s needs. Offer feedback on your résumé. Career Counseling – Are you employed but not enjoying your work on a day to day basis? Not sure of your next career move? Are you returning to the workforce after a long absence? 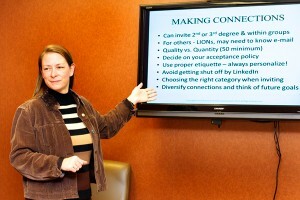 I can meet for individual sessions to assist you in the process of career exploration and decision making. It is best to meet face-to-face for career counseling because some of the activities need to be done in person. If you don’t know what you want to do, we will need to start out with some assessment tools to help you make informed career decisions. If you know what you want, we can jump right into strategizing your next move. Job Search Strategies – How long has it been since you looked for a job? If it’s been a few years, it’s likely you need a primer on job search methods and tactics for today. With changes in technology, there were inevitably changes in recruitment strategies. That said, networking is still the best way to get a job and that hasn’t changed. Do you feel uncomfortable networking? Do you know where to network? Do you use LinkedIn to network? Mock Interviews – Maybe it has been a while since you have practiced your interview skills? Holding a mock interview is a great way to ensure success for the real thing. You provide a job posting for the session. I use my human resources (HR) background to create a simulation of what you will encounter in your job interview. After the interview, I will provide customized feedback and share tips for winning the interview. Ideally mock interviews are done in person but they could be done by Skype if needed. Résumé writing – I believe in working with you to improve your résumé instead of “doing it for you”. By showing you where it can improve, you learn future career management skills while developing your résumé. With my expertise and your knowledge, together we can create a résumé that gets you noticed and showcases your unique talents. If you prefer someone to write the résumé for you, I can refer you to a seasoned résumé writer. Pricing – Prices vary depending on the services provided and the scope of the project. Call 443-254-8173 for a quote based on your specific needs.